Please---we do not want to hear these words from YOU…it's much easier to win the first time around then to re-open your case later. THIS INFORMATION WILL HELP YOU, AS A FATHER, MAKE YOUR STRONGEST CASE FOR CUSTODY. It will also directly help protect your children now and in the future. Your children will thank you one day for taking "their best interests" seriously! 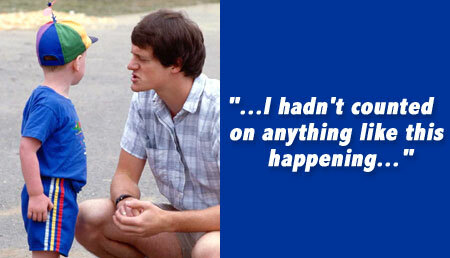 First, we would like you to know how we have come to be in possession of so much important information. Over the 30-plus years of our working in the child custody field, we have become increasingly involved in cases that frequently may find their way into court. We have acted as expert witnesses, custody evaluators or consultants for hundreds of parents involved in custody disputes all over the country. 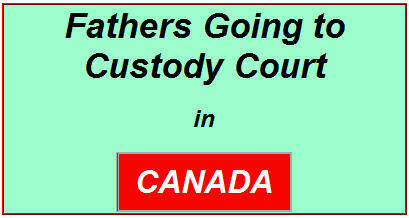 Further, as editors of a national publication on custody matters, as responders to a 24-hour "hotline" where we answer questions from professionals about our tests, and as directors of an international organization, made up of custody experts in the United States and Canada, we continually hear from judges, attorneys, professional experts and parents who in one way or another have been caught up in custody disputes, some of them simple, but most longstanding, complex and bitter. Our “Strategies” book has been a bestseller in both the United States and Canada since 1988. It is continually updated so our readers are always getting the most recent information and ideas available. We were shocked at how many bright, wise, loving---indeed even "savvy"---fathers did not know the single most important fact that must be true if one is to prevail in a custody dispute. And this must be the best kept secret in the world, because even extremely intelligent, sophisticated professionals fail to make use of it. Indeed, even attorneys, who themselves as parents are caught up in custody disputes, frequently do not know how to make his single most important factor work for them. We identified fourteen "key behaviors" that differentiate between parents who do well in custody disputes from those who do not. We consider these behaviors to be strategically critical. We have identified what we see as the single biggest mistake a father in a custody dispute can make. And the irony here is that our own legal system actually encourages fathers to make this huge mistake. If you are a father in a child custody dispute, you must learn to recognize (and deal with) blatantly wrong and immoral strategies that will likely be used against you. To add insult to injury, these strategies can be effective. And in our experience, many attorneys fail to help their clients deal with these tragically effective strategies, because they are more psychological than legal strategies, and attorneys are not often trained either to recognize or deal with them. Another exceedingly important point is that too many fathers do not fully understand all the important things their attorneys should be doing for them. Simply put, many fathers do not know what they should ask for. One of the saddest situations happens when a child has been bribed or manipulated into turning against the father--and frequently this father is, in our opinions, the better of the two parents. A case we are actively working with right now illustrates what we are talking about. The father, a warm and hard-working professional, runs into all of the following from his ten year old daughter, when he tries to phone or comes to pick the girl up for a visit. Unfortunately, most fathers singled out to be the victims of such vitriolic attacks are poorly equipped to deal with them. They start out trying to be calm and loving, but all too soon are worn down by the hurt, frustration and road blocks continuously thrown up when they attempt contacts with the child. They end up either retreating, or counter-attacking---neither of which can lead to a happy outcome. It is essential that fathers caught up in this kind of trap learn the four strategies that can be truly effective and helpful in this situation. We have seen the cases where fathers failed to prevail because they had minor physical illnesses that were neither life-threatening nor related to childcare abilities. Finally (but of major importance) we learned ways a father caught up in a custody dispute can control costs. It has made us sad and sick at how often it is blatantly obvious that the wrong parent often wins during the custody process. The best parent loses; the parent who operates "in the best interests of the child" loses! Why? Because it is surprising how many fathers, even very bright, professional people, do not know how to make their best case--even with their own attorneys! You will find the answers and solutions to EVERYTHING discussed in this letter in our new "Strategies" handbook written for fathers involved in custody disputes. Unlike a hardcover book, that can take a year or two to produce, we are able to review and update whenever necessary by using the latest information as it becomes available to us through our continuing contact with judges, attorneys, mental health professionals, other parents, the latest scientific research, and experts on many special and unique problems that may arise. Finally, it is very important to us, as people (and parents ourselves) who on a daily basis witness what can go wrong for a father caught up in a custody dispute, that we may be able to help you avoid mistakes that can prove disastrous. Since 1989, thousands of fathers from every state in the United States have relied on the incredible expertise of Dr. Bricklin and Dr. Elliot to get them through what is a very specialized field, with many hidden dangers for men. 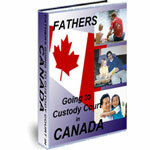 about Child Custody in Canada ever developed. There are 330 total pages, divided into eleven different sections that can be viewed and printed individually. You will not be rushed--- you will be able to return to the Download Site over and over to view or print the information as you need it (including any new information that is added). and to review new material as it is added. 1. What are the basics of child custody? 2. What does the court look at to determine custody? 3. What kind of parenting plans are there? 4. What happens to child custody if I move away? 5. What are some Canadian child custody acts? 1. What are the factors which affect child custody arrangements? 2. What are the characteristics of typical custody arrangements? 1. What are Canadian child support guidelines? 2. Do these guidelines apply to you? 4. What are the tax rules? 5. Are your payments considered "support" payments? 2. Are different custody arrangements possible? 3. Who can get custody? 4. What is access and visitation? 5. Who can get access and visitation? 6. What could cause access and visitation to be denied? 7. How are orders or agreements enforced? The most important "piece of the puzzle" in winning your custody case is selecting the RIGHT lawyer! Dr. Barry Bricklin and Dr. Gail Elliot, nationally-known child custody experts, have used their 40 years of custody experience to help you select the attorney who will do the best job for YOU! "FROM DR. BRICKLIN AND DR. ELLIOT"
"We have carefully tracked all of the factors that seem to hold true with people who do well in custody disputes. That is, we compared the strategies used by people who do well in such disputes with those who do not do well, and have identified fourteen key items that we think are of particular importance." "Here we will deal with a number of strategies that could be used to damage your position." "Of course, the major strategy that could be used against you is for the children to have been alienated from you. This may have been done in subtle ways that escaped detection, or it may have been done prior to any opportunity for a trained evaluator to spot it." "One of the things we want to cover is what is called in the scientific community the role of "bias." Biases are behaviors (here, we speak of those we observed in the psycholegal world) that can work against you, even though the so-called negative item does not really predict bad or poor parenting skills. A bias is much like a prejudice. We call a criticism "prejudiced" if we feel that a person is being faulted for something that does not really point to any true negative. We have observed the prejudices covered here among judges who are otherwise fairly intelligent and well meaning. It is of upmost importance to understand these biases (or prejudices) so you can counteract their effect on your custody case. Example: If you knew that female judges were prejudiced against men who wear sports shirts because they believed that they were flaunting their masculinity YOU WOULDN'T WEAR A SPORTS SHIRT TO COURT." There are many items to think about and consider as you prepare to get involved, or re-involved, in any custody dispute. This list will help you better organize these items. It has been prepared using all of the training and experience of our 35 years in the field as Custody Evaluators, Expert Witnesses, Authors, and Consultants in Custody Cases all over the United States. If you energetically follow the Checklist, dig out all of the necessary answers and write them down, and communicate that information to your lawyer, witnesses, etc., you will significantly help your case! A variety of precedent setting cases are presented that will show you what is involved in the legal process, how judges "think", and what you must be able to prove in court. NOTE: Many purchasers of this publication have copied specific cases for their attorneys. The report discusses what is known about the factors that affect child custody arrangements, the characteristics of different custody arrangements and their effects on children and their parents. The emphasis is on shared custody. This report reviews many of the challenges facing children and families before, during, and after family separation, and contains suggestions regarding custody and access legislation and family law services and processes that might assist in resolving family disputes and reducing trauma to children and their families. The role of the child in family law disputes is undergoing re-examination. It is recognized that a child's perspectives may not be conveyed to the court if counsel for the parents are the sole parties putting forth the evidence. In recent years, some academics, judges and practicing lawyers have taken the position that it is in the best interests of children that "they participate in decisions that affect them and that they be listened to and taken seriously." This paper discusses the Troxel and Chapman cases (involving grandparents being denied access to grandchildren) in detail, examines the roles grandparents can play, the suitability of the best interests of the child test in these circumstances, reviews American and Canadian case law, discusses constitutional and policy considerations, and recommends several alternative approaches to grandparent access cases. The STRATEGIES really helped with my case. The information about how our system works here in Canada was very valuable. Drs. Bricklin and Elliot, if you could see my little boy laughing again you would know how much your information helped me. God Bless you both!. I met you both when you gave your seminar here in Vancouver. I recommended your Package to one of my patients and it really helped. Thank you both. After three years I’ll finally be with my boys again. The nightmare is over, due in large measure, to the wonderful strategies that you showed me and that I was ab;e to put into action. Thanks for your help! What do judges look at when they make family court decisions? This Package contains over 1200 pages. You will automatically receive the most recently updated package of publications.